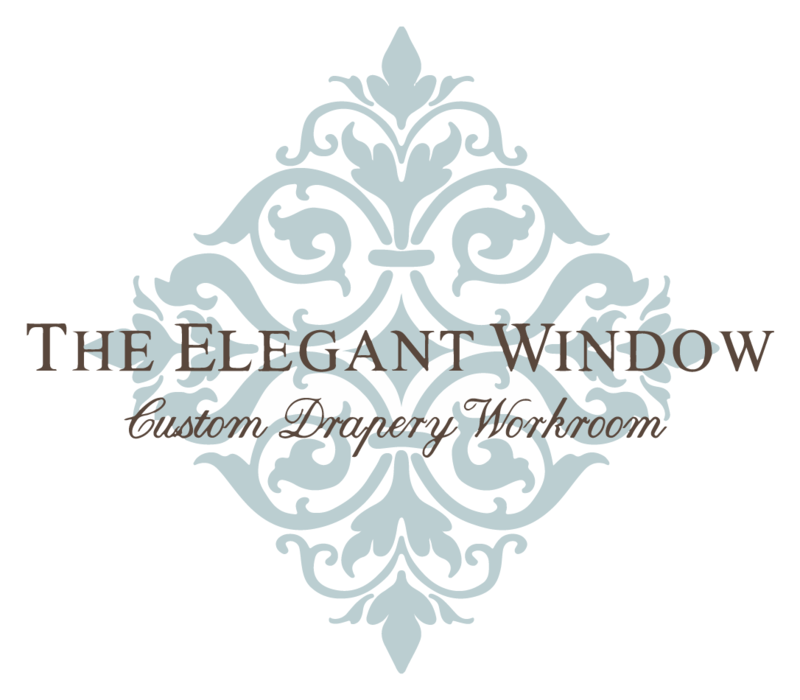 There has been no shortage to unique projects that interior designers have sent to The Elegant Window. 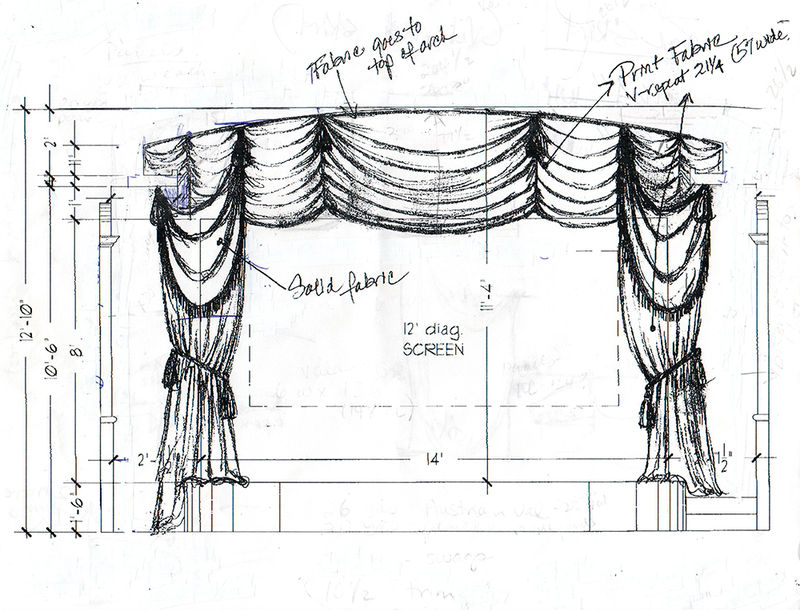 The job began with a sketch from the designer of the theater room. The window treatment consisted of an Austrian Shade, an Austrian Valance, a pair of draperies and a pair of asymmetrical swags. I went on-site to provide measuring services and evaluate the architectural details. I was able to provide a quote for labor and figured the yardage required. Most homes have at least one challenging window and in this home, the “window” was a theater screen and the area surrounding it was the challenge. The ceiling was arched and there was a soffit on each side of the room that protruded right into the area where the window treatment needed to be installed. After taking careful measurements, I felt it was possible to work around the soffit. The first order of business was to get a template made of the arched ceiling to ensure the valance fit perfectly flush into the arch. The drapery installer made the template which was then given to our carpenter. The carpenter made a wood cornice with which we could attach the Austrian Valance. Now it was time to make our patterns. 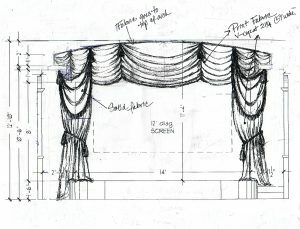 For the large swags that hung in front of the drapery panels on either side of the theater screen, I needed to drape a string exactly where the swags would be installed – making note of the width of the swag and the length. The swags were to be asymmetrical so I needed to make a note of that as well. 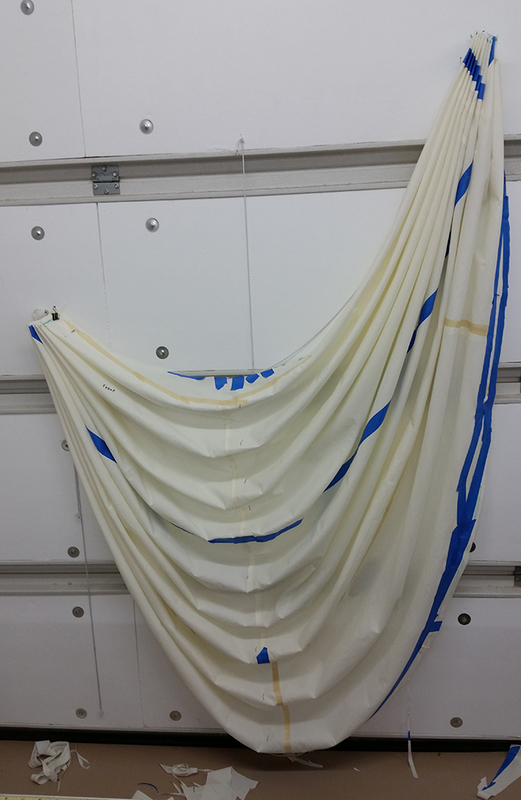 I also needed to drape a string to mimic the bottom curves of the Austrian Valance. 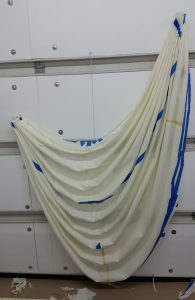 Using the designer’s measurements, I draped the string to mimic the swoop in the valance. When completed, I noticed that the bottom curve of each swoop did not look right in relation to each other. I took a picture of the pattern and sent it to the designer to determine if this is what she intended. Although she initially wanted the center swoop to be much wider than the other swoops, we agreed they needed to be closer in size. I draped the string again and found a pleasing size for each swoop. I took another picture of the revised pattern and sent it to the designer for approval. Now the patterns were made for each section and we were ready to begin fabrication. The fabrication was completed with plenty of time for the appointed installation. 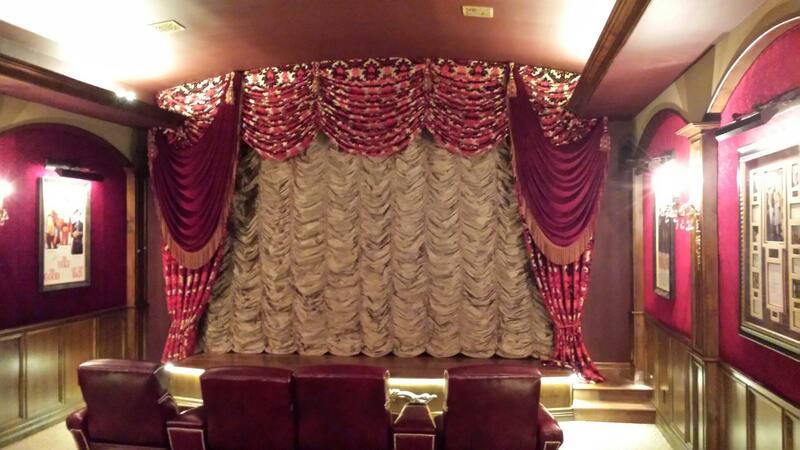 The arched valance fit perfectly into the space. Once the valance was installed it was time to cut into the valance on each side so the valance could go over and under the soffit. The valance was cut and the raw edges were folded back and then attached to the bottom of the soffit. The panels and swags were installed and dressed. As you can see, the finished product was breathtaking! 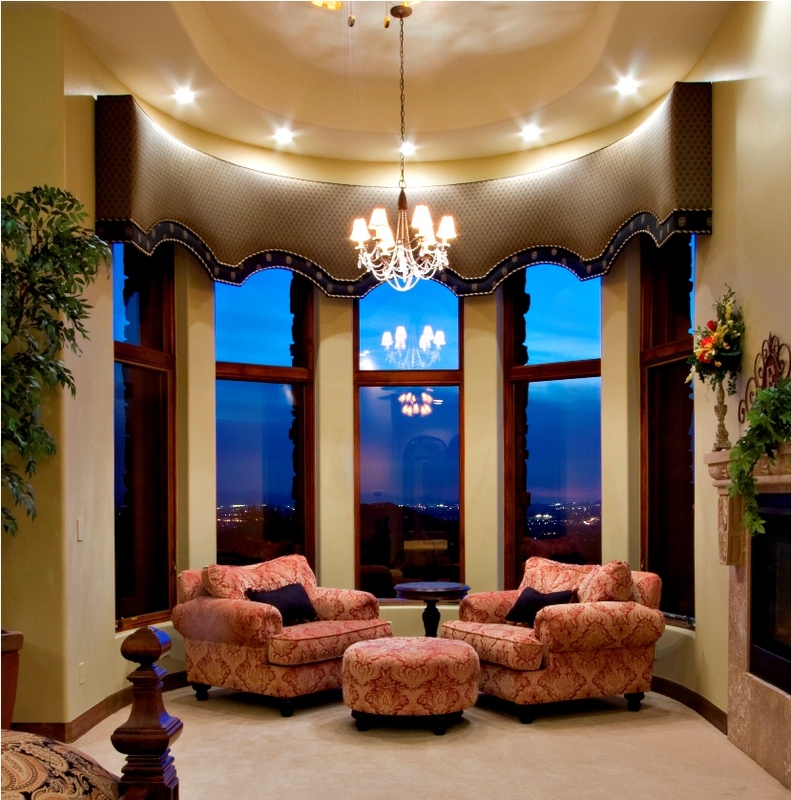 The design included five arches which would need to be centered exactly over each window. The fabrication of the bowed cornice would need to be done carefully to ensure the fabric was upholstered onto the bowed cornice box smoothly and precisely. We had to consider how the finished cornice would be transported to the job site. This was a large cornice – 250” from end to end and 30” tall. The first thing that needed to be done was have a template made of the bowed wall, being careful to mark on the template the location of each window. The template was given to the carpenter and after discussing the logistics of transporting the cornice, it was decided that a hinge in the center of the cornice would solve the transportation issue. The hinge allowed the cornice to close, or to fold in on itself, and be transported in the installer’s van and then opened up at the job site. This saved the client money because a moving truck did not need to be rented. The cornice was upholstered in the “open” position and the fabric on the dust cap, as well as the facing on the bottom of the cornice, was split in the center in order for the cornice to be able to close. A bowed cornice is challenging to upholster because one is not able to simply pull the fabric taught, secure the fabric to each side of the cornice and then staple the fabric down at the top and the bottom of the box as is done on a straight cornice. A bowed cornice needs to be upholstered beginning from the center out. This step cannot be rushed – it needs to be done very slowly, making sure the fabric is smooth and free of any wrinkles as one continues stapling the fabric around the convex shape. The banding had to be carefully upholstered onto the cornice using the same method of upholstering from the center out. The rope cord trim gave this project the finishing touch. Although this project had its challenges, the finished product resulted in a very satisfied designer and her client was thrilled with the transformation of her master bedroom.